Manufactured in Japon from 1989 until 0. It was presented at the Photokina in1988 under the "name" of VCW, and then was presented at the SITI show in 1 989 under the final name of MS-40. It is part of a range of "Heavy Duty" Konica with the various names: "Off-road", "Genba Kantoku", "MR.640." All are more or less reinforced to withstand salt spray, dust, sand, shocks, but none is actually submersible. In this, these devices remain below the Fuji HD. The MS-40 is noted for its array of infrared transmitters and receivers that are acting for its autofocus system and the kind of window that protects the lens. Its khaki colour and the rubber reinforcements make it looking like a military equipment. Controls are oversized enough to allow their use with gloves. The ergonomics of the right side has been particularly studied. 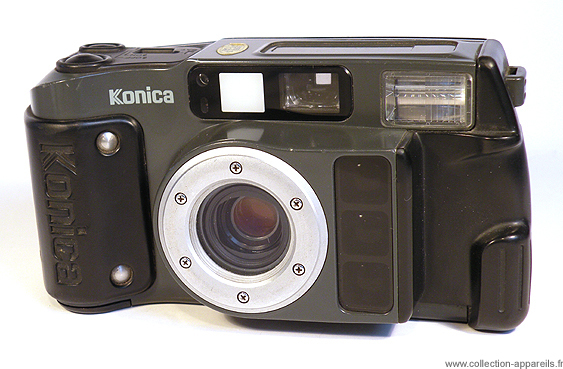 The big rubber bump has it efficiency reinforced by the marking "Konica" which serves as an anti-skidding. The two trigger buttons and various controls are very well positioned under the right index finger. The button has a different action depending on the number of pressure being done upon it. This avoids looking at the LCD. Under the thumb is the memory button.